(ABC TV, 7:30 Report, 2017.04.17) US Vice President Mike Pence has warned the ‘era of strategic patience’ with North Korea is over after the country carried out a failed missile launch. The world now awaits the next move of the brutal North Korean leader Kim Jong-un. DONALD TRUMP, US PRESIDENT: North Korea’s a problem. The problem will be taken care of. LT. GENERAL H.R. MCMASTER, WHITE HOUSE NATIONAL SECURITY ADVISOR: The President has made clear that he will not accept the United States and its allies and partners in the region being under threat from this hostile regime. LEONID PETROV, ANU COLLEGE OF ASIA AND THE PACIFIC: The whole population is determined to stand up and fight until the last bullet, until the last soldier. STAN GRANT, REPORTER: North Korea is at war. Nothing has changed in more than 60 years. For this reclusive country, the Korean War has never ended. LEONID PETROV: For North Korea, the state of war is their normal state of existence, and the population of North Korea is told every day that the war is going on, it never ended in 1953. STAN GRANT: The drums are now beating louder. American warships are steaming near the Korean Coast. This past weekend, North Korea put on a display of its own firepower. It sends a deadly warning – it has the weapons and, if pushed, it could use them. LEONID PETROV: The worst thing for the Kim regime is an attack, a regime change, occupation of North Korea, total chaos and the termination of the dynasty. STAN GRANT: Leonid Petrov has spent a lifetime studying this hermit kingdom. He was in the capital, Pyongyang, just this year. It is, he says, a strange place, where time has stood still. LEONID PETROV: North Koreans live in year 106. LEONID PETROV: Yes, 106th year after the birth of their founding father. Kim Il-sung. STAN GRANT: They’re not living in the 21st Century? LEONID PETROV: They live in the year 106. STAN GRANT: Survival of the regime now rests with the boy king, Kim Jong-un. He came to power before he was 30 years old. Like his father and grandfather, he is brutal, he executes writers, he rules his people with fear and he continues to amass a military that threatens nuclear apocalypse. In a report for the United Nations, former Australian High Court judge Michael Kirby peered into this terrifying world of secret prisons, mass starvation and state-sanctioned violence. MICHAEL KIRBY, UNITED NATIONS INVESTIGATOR: We found that there was widespread, prolonged and brutal wrongs done to the people of North Korea, many of which rose to the level of crimes against humanity. STAN GRANT: So, could a regime that turns its guns on its own people launch an attack against the rest of us? LEONID PETROV: If North Korea is attacked with the force which is similar to nuclear capability, nuclear attack, then North Koreans probably wouldn’t think twice before using the weapons of mass destruction. STAN GRANT: Petrov fears an American attack that pushes North Korea into a corner. Kim Jong-un, he says, would immediately strike across the border into South Korea. Military strategists believe it could rain down half a million artillery rounds in just one hour. 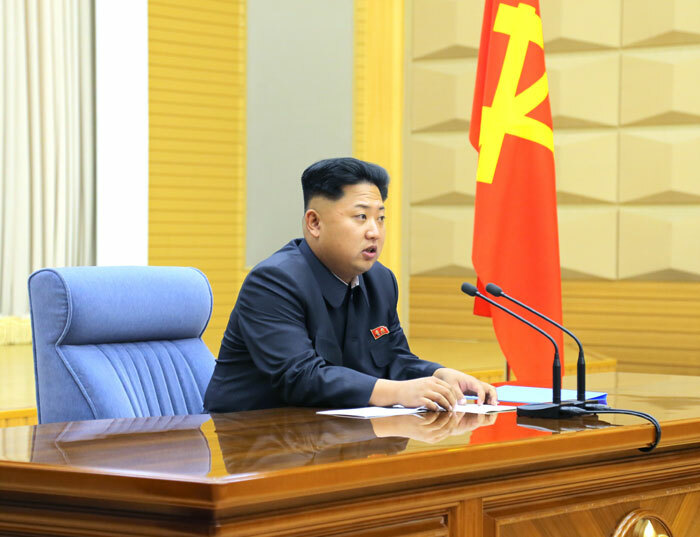 (by CHAD O’CARROLL, NK News Pro, 26 AUGUST 2013) Kim Jong Un made a “significant decision” to protect the sovereignty and safety of the country at an “enlarged” meeting of North Korea’s top military commissions, state media said on Monday. Practical measures for bolstering combat and defensive capabilities were decided and guidelines issued to promote Songun military first policy, the Rodong Sinmun said, adding that an unspecified “organizational issue” was also discussed. The meeting took place amid North Korea’s 53rd annual Songun Day anniversary – designed to underscore the importance of country’s military-first ideology – and ongoing ”Ulchi Freedom Guardian” joint U.S.-ROK military drills in South Korea. Although no further details of the meeting were published, Daniel Pinkston of the International Crisis Group told NK News, “I think it’s a strong signal that another missile launch or nuke test could be in the works…If I were a betting man, I’d say within next 2-3 months”. “I see this as a very bad sign, it’s very similar to the meeting earlier this year before the nuke test,” Pinkston added. North Korea’s powerful Central Military Commission last held an “enlarged” meeting in February 2013, approximately ten days before Pyongyang tested its third nuclear device. The announcement of that meeting was highly unusual, and perhaps unprecedented and came immediately prior to joint U.S.-ROK naval drills. But despite similarities with the February meeting, Australian National University North Korea researcher Leonid Petrov told NK News that the importance of the Songun Day meeting should not be overestimated as the military commissions involved are “only responsible only for coordinating the work of Party organisations within the Korean People’s Army”. “Even its enlarged meetings cannot match the power of the National Defence Commission, which is also chaired by Kim Jong Un, and simply deals with ideological issues in the Korean People’s Army”. When the North Korean leader Kim Jong-Il breathed his last in December 2011, his youngest son Kim Jong-Un was catapulted to the country’s leadership. That permitted him to meet the people and play the role of populist and reformer. Kim Jong-Un looked and behaved like his grandfather, Kim Il-Sung, the founder of the Democratic People’s Republic of Korea, who ruled for 46 years. His succession looked like a perfectly planned and well-orchestrated scenario, and no observers doubted the similarity was part of the transition plan. On the first day of 2013, Kim Jong-Un addressed the nation from the state TV, just like his grandfather used to until his demise in 1994. Kim Jong-Il, on the other hand, avoided making public speeches and never gave a TV address during his 17-year-rule, publishing his New Year’s messages as joint editorials in North Korea’s three major newspapers. Obviously, the youthful new ruler was trying to appeal to North Koreans’ fondest memories of his grandfather, and to signal that his leadership style would be more in line with that of Kim Il-Sung. The speech was an acknowledgement of the poor state of the country’s economy. Kim promised that 2013 would be ‘a year of great creations and changes in which a radical turnabout will be effected in the building of a thriving socialist country’. The speech was full of rhetoric calling on his countrymen to make tireless efforts to ‘rid themselves of the old way of thinking and attitude and make ceaseless innovations in all work’. Kim urged boosting the economy and the military’s capability by making the science and technology sector world class, and argued that ‘the industrial revolution in the new century is, in essence, a scientific and technological revolution’, and ‘breaking through the cutting edge is a shortcut to the building of an economic giant’. Like his grandfather, who tried to instantly turn the war-torn North Korea into a communist paradise, Kim Jong-Un also looks for shortcuts. The problem with his plan is that he suggested nothing new, but encouraged his countrymen to stick to the old values and principles formulated by his late grandfather and father. Kim claimed that ‘road of chuch’e [national self-reliance] is the only path for the Party and people to invariably follow’. Despite North Korea’s history of defeats, failures, famines and disappointments, Kim Jong-Un persisted in lauding ‘the great achievements the president made while leading the Fatherland Liberation War to brilliant victory’ and praised ‘the strength of his outstanding strategy and tactics and wise leadership’. He also urged the people to ‘carry out the cause of reunifying the country’, describing reunification as the greatest national task that ‘brooks no further delay’. The theme of turning North Korea into an economic giant was the most recurring in the speech. The ostensible purpose of his plan was to make the people of Korea well off with nothing to envy in the world. For this, the people should wage an ‘all-out struggle this year to effect a turnaround in building an economic giant and improving the people’s standard of living’. By calling on all sectors and units of the national economy to boost production, Kim Jong-Un again simply repeated the style and rhetoric of his father and grandfather. Instead of offering a meaningful formula for economic development, Kim simply recommended improved economic guidance and management: ‘Party organisations should embrace all the people, take warm care of them and lead them forward to ensure that they share the same destiny with the Party to the end’. That meant North Koreans should carry on ‘the tradition of single-hearted unity’ wherein ’the Party believes in the people and the latter absolutely trust and follow the former’. In other words, Kim had no other prescription than adhering to the old son’gun [military-first] politics of his father and the centrally-planned economic system of his grandfather. The single-hearted unity of the Army and the people around the Party was the ‘strongest weapon and a powerful propellant for the building of a thriving socialist country’. 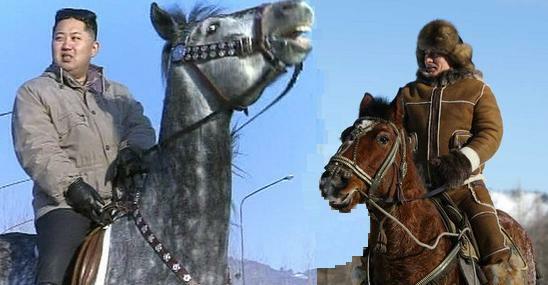 Kim Jong-Un looked confident when he claimed that the military might of a country represents its national strength. His speech avoided direct criticism of the United States and its allies. Nor did he mention nuclear weapons, but indicated that if aggressors dared launch a pre-emptive attack against the DPRK, ‘the People’s Army should mercilessly annihilate them and win victory in the war for the country’s reunification’. Boosting defence industry was another priority that could contribute to implementing the Party’s military strategy, and Kim urged developing more ‘sophisticated military hardware of our own style’. His invitation to ‘spur the building of a civilised socialist nation to usher in a new era of cultural efflorescence in the 21st century’ was in sharp contrast to his recommendations to ‘conduct Party work in the same way as it was done on the battleline in the 1970s, and put a focus of the work on thoroughly applying Kim Jong Il’s patriotism in all activities’. In cultural construction as well, all sectors were advised ‘to implement to the letter the ideas, lines and policies set forth by the general’. In this context, it remains debatable how North Korea can develop education, public health, literature and the arts, physical culture, public morals and all other branches to the level ‘appropriate to an advanced civilised nation’. In order to effect a radical change in this year’s campaign to build a thriving socialist country, ‘officials should make a fundamental turnabout in their ideological viewpoint, work style and attitude’. But will the Party bureaucrats voluntarily uphold the slogan ‘Everything for the people and everything by relying on them!’ set for them by their youthful and idealistic leader? No safeguards are suggested by Kim Jong-Un, who only asked them to ‘work to the best of their abilities with a high sense of responsibility, eagerness and an enterprising approach’. His conclusion is built on the premise that the nation can achieve prosperity only if ‘firmly rallied behind the Party under the banner of ‘Kimilsungism–Kimjongilism’. The New Year speech tells much about Kim Jong-Un, the succession process, and the future of North Korea. It becomes clear that Kim’s ultimate goal is to avoid any change, because it threatens the very existence of the North Korean state. If anything like what happened to the Soviet Union when Gorbachev started perestroika happens in North Korea, the leadership would not be able to control the situation. And as North Korea’s elites are equally reluctant to consider any idea of change, the mood to maintain stability and continue as Kim Il-Sung and Kim Jong-Il did over the past half a century prevails. The recent leadership succession is definitely a case of like father, like son. Kim Jong-Un is the legitimate successor and perfect choice to continue the Kim dynasty; he is of ‘revolutionary blood’ and widely recognised as such. He is eulogised and worshiped as the Generalissimo by the Korean People’s Army and as the Dear Leader by the Korean Workers’ Party. Common people link their expectations of socio-economic improvement to him, and he is a token of stability for the Kim family. Everyone in North Korea seems to have great hopes for him. If everything goes according to his father’s plan, Kim Jong-Un will be in power for a long time. The North Korean leadership genuinely wants to modernise the country’s economy, but hates the idea of changes in social and political life. Like his father and grandfather, Kim Jong-Un constantly searches for shortcuts to boost the dysfunctional economy without having to build new social and political institutions. Achieving technological breakthrough without systemic reform is a preferred way forward. As a result of this half-hearted policy, ordinary North Koreans will probably eat and dress better; they might even own PCs and mobile phones, but they will continue to live in the same paranoid state of fear and dependency on the Great Leader’s decisions. Beijing would love to see Pyongyang follow its example by introducing market-oriented reforms, but North Korea simply cannot come to terms with granting its population the many freedoms necessary to make such a reform successful. This is simply impossible in the conditions of an ongoing Korean War, in which North Korean society is continuously fed lies by the regime and denied contacts and interaction with the rest of the world, particularly with South Korea. Given the circumstances of the ongoing inter-Korean conflict, the sustainable development of the North Korean economy is impossible. The country is locked in a security dilemma and reluctant to open up. If Kim Jong-Un did decide to initiate reform he would first need to persuade his family and other elite groups to forfeit their significant privileges, because reform of any type would inevitably and quickly lead to the collapse of the political regime. 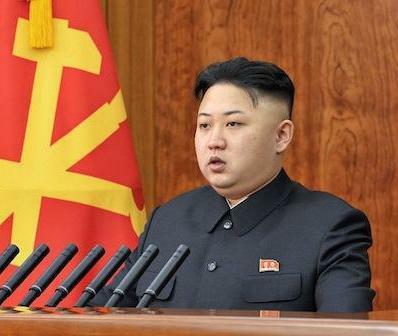 Not surprisingly, the very word ‘reform’ remains a taboo in Kim Jong-Un’s North Korea. (by Justin McCurry in Tokyo and Tania Branigan in Beijing guardian.co.uk, Tuesday 12 February 2013). 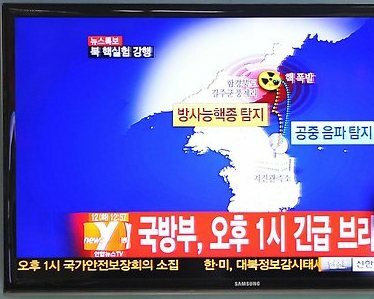 Regime confirms it set off its third nuclear bomb, signalled by an earthquake detected by South Korea, Japan and the US. North Korea has drawn widespread condemnation after conducting a nuclear test in defiance of international bans – a development signalled by an earthquake detected in the country and later confirmed by the regime. The test, which took place in the north-east of the country just before noon local time, could bring North Korea a step closer to developing a nuclear warhead small enough to be mounted on a long-range missile and possibly bringing the west coast of the US within striking distance. The authorities in Pyongyang said scientists had set off a “miniaturised” nuclear device with a greater explosive force than those used in two previous nuclear tests, in 2006 and 2009. …Dr Leonid Petrov, a North Korea expert at the Australian National University, said it would bolster the North’s case for describing itself as a genuine nuclear state. Petrov suggested the North might be willing to freeze its civilian nuclear programme if given sufficient incentives, such as the loosening of international sanctions. It would also need assurances, particularly from the US, that it would not be the target of attempts at regime change or military strikes. The only alternative, he said, was a pre-emptive strike that could miss many of the country’s underground nuclear sites and raise the dangerous prospect of a counter-attack. Petrov said the North’s determination to push ahead with its nuclear programme was a failure of diplomacy that began with the administration of George Bush, who described the country as part of an “axis of evil” when Washington adopted a tougher stance in 2002. Kim Min-seok, a South Korean defence ministry spokesman, said the North had informed China and the US in advance of its intention to conduct the test but could not say when the message was relayed. Petrov said that, if true, the decision to inform other nations in advance was a marked change in the regime’s approach under its leader, Kim Jong-un, who has been in power just over a year. Kim has shown no sign of ditching the nuclear ambitions of his father, Kim Jong-il, but has been more open than the country’s former leader about his regime’s intentions, having also given notice of its recent satellite launch using a ballistic rocket. What should the Six Party Talks be about? I do not believe in success of the Six-Party-Talks because there are too many parties, their intentions are too different, and their approach is wrong. 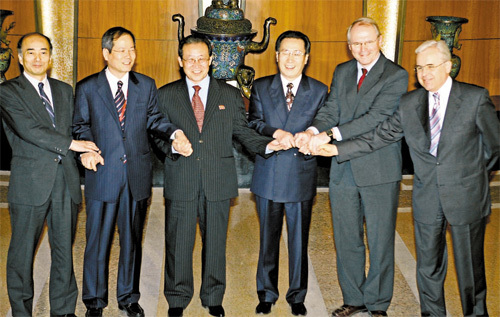 Since 2003, when this forum was convened for the first time, the five nations tried to persuade North Korea to disarm it unilaterally and unconditionally despite the fact that Korean War had not finished. They also targeted the North Korea’s nuclear and space exploration programs, automatically denying the DPRK of the right to generate electricity and launch peaceful satellites. Finally, after 2009, the US, ROK and Japan refused to participate in the Six-party-Talks, demanding from North Korea to demonstrate a “sincere approach”, which is impossible to measure or describe. Then, naturally, there will be no need in demanding from North Korea to destroy its nuclear and space programs because there would be enough safeguards against nuclear proliferation or inappropriate usage of these technologies. Only then would people on the Korean peninsula and the region stop worrying about a new devastating conflict. In other words, the Six-Party-Talks have been addressing the issues in the wrong order and from the wrong end. Was it done by mistake? For the answer, see my previous post about the Cold-War unity and struggle of the opposites in East Asia. Why North Korea should be a foreign policy priority for the next US President? In March 2012, during a nuclear summit in South Korea, in a conversation the two leaders believed was private, Barak Obama whispered to Dmitri Medvedev that his second presidential term would empower him with much flexibility. 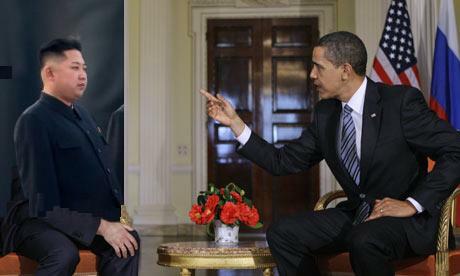 Certainly the European missile defence issue is not a sole problem that Obama will need to face after being re-elected. North Korea with its nuclear and missile programs will be the most burning issue of US foreign policy in East Asia. However, after six decades of confrontation in Korea, where a diplomatic cat-and-mouse game seems endless, one may ask a reasonable question: can America ever come to terms with the existence of North Korea? The rules of the Cold War, which continues in East Asia, are based on the dialectical principle of the unity and struggle of the opposites. Washington badly needs Pyongyang to keep its presence in the region and to strengthen its security alliance with the ROK and Japan. Equally, Pyongyang cannot survive and justify its authority domestically without the hostile attitude and actions of Washington, helping China realise how much it needs North Korea. War preparations are too profitable and ideologically consolidating for both camps to render them obsolete. Thus, the US’s North Korea policy (under Obama or any other president) will remain the same and continue to hinge on the expectations of DPRK’s soonest collapse or democratisation (which is equivalent to collapse). Any attempt to soften the US policy towards North Korea will ultimately lead to the question of diplomatic recognition, security assurance and fair trade. No president of the US will accede to that without damaging its relations with Seoul and Tokyo. Similarly, no North Korean leader would go as far as to making peace with the US without demanding excessive reparations, public apologies and other symbols of moral superiority. Everything else would be a mere diplomatic smoke screen designed to hide the real intentions of the parties voluntarily locked in a security dilemma until one of the actors of this stand-off decides to give up and unilaterally surrender. I don’t envisage this happening during president Obama’s second term.